It seems appropriate that I photographed this magnificent house on Ground Hog Day, a magical day associated with time and shadows and things seldom glimpsed. As best I can tell, there are at most eight hours each year when the façade of the Dallam-Merritt House is visible. For most of the year, it is blocked by the leafy trees. All year, it is blocked by a parked car or by something bulkier. However, twice a month, on the first and third Thursday, parking is prohibited for two hours to allow mechanical street sweeping. That leaves four hours in January and four in February to admire this building. The Dallam-Merritt House is an unusual example of Second Empire and Italianate styles, especially remarkable for the shape of its Mansard roof. 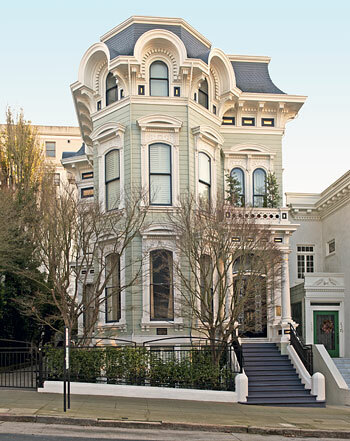 It is one of San Francisco's very few surviving luxury residences built about 1870. The house was originally located at 528 Sutter Street but was moved to its current location in 1900. All buildings in the 500 block of Sutter Street were destroyed by the 1906 Earthquake and Fire. Consider Highclere Castle (Downton Abbey). Lovely building. Consider the Taj Mahal, the Doge's Palace, the Parthenon, the Lincoln Memorial, the Sagrada Familia, the Winter Palace of the Tsar, the Hagia Sophia, San Francisco's own City Hall and Opera House and Legion of Honor. Lovely buildings, all. Essential to their appeal is that they stand unobstructed to be admired from any angle and at any distance. Over the past twenty years or so, many of San Francisco's most distinctive buildings have gone into hiding behind ill-considered street trees. Except for the Spreckels Mansion Spite Hedge which clearly flips the bird to San Francisco, most of these trees were planted in good faith to beautify the streetscape, filter the air, increase property values; but like the cute SPCA puppy who grows up to be a two hundred pound mastiff, many of our street trees would be more at home in the country than the city. Here is a short list of some striking San Francisco buildings which I wish were more clearly visible. I'm sure the Hop-On Hop-Off tourists would enjoy them too. They can see an ineptly pruned ficus or an ailing plane tree anywhere.